This is one of the coolest sandwich recipes I have ever seen! 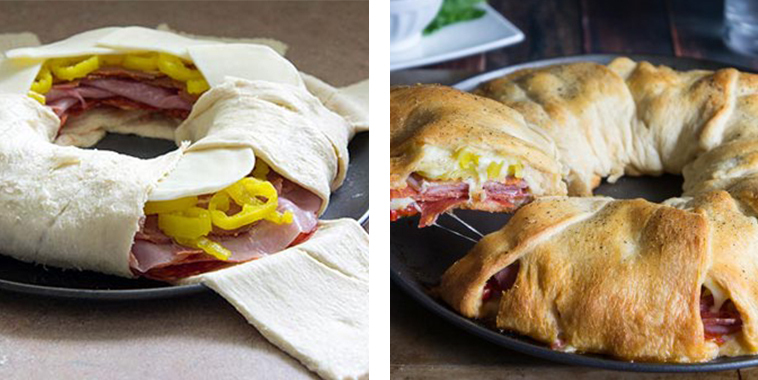 The finished recipe looks like you slaved away making this Italian sandwich ring! Although that’s definitely not the case here. It is made so simple by using crescent rolls! You get all the yummy flavors from an Italian sub in one big sandwich ring! This is prefect for parties or a quick and easy dinner! If you want to mix up the ingredients inside you easily can! The prep time is only 10 minutes and there are step by step pictures to make preparation even easier! Go to the bottom of the pictures to click on the recipe!